Join EEPSA at their Annual General Meeting just before the Walking the Talk Connecting Classrooms to Communities event. All members and potential members are welcome. This will be an opportunity to learn more about EEPSA, and to consider joining the board. Eight of our School District 6 (Rocky Mountain) educators have just returned from the 2017 Leadership Clinic, and are renewed with energy and momentum. Our team was made up of three educators from the Kimberley zone (Dan Clark, Laurie Neeve, and Natasha Burgess), three from the Windermere zone (Tara Whittick, Hannah Garvie-Ransen, and Alyssan Gauthier), and two from the Golden zone (Sandra Beckett and Caren Nagao). The Leadership Clinic never seems to disappoint, and our team felt so empowered by our planning and networking time. This conference truly does ‘walk the talk’! Our Local Chapter of EEPSA, which can now be identified by the title, Rocky Mountain Place-Based Learning Network,wanted to express our gratitude for the support provided by EEPSA. The teachers who attended this clinic commented numerous times on the value of connecting and collaborating in such a beautiful space. Having the gift of time and space to explore ideas about where we want to go was so incredibly valuable, and there were many comments about how wonderful it is to have a group of like-minded educators to share ideas with. For a slideshow of photos from the 2017-18 Leadership Clinic, please use this link: https://animoto.com/play/zlXUQ0hk8SzqlfDBySXfOA. Our team has come away with ideas about a number of amazing professional development opportunities for the 2017-18 school year, so keep an eye out for messages from the Rocky Mountain Place-Based Learning Network! The 2017 Leadership Clinic will help to facilitate the development of a Local Chapter of the Environmental Educator’s Provincial Specialist Association (EEPSA) in each school district in the Columbia Basin. A Local Chapter is a teacher-driven organization that helps local teachers come together to collaborate, engage in professional development and influence curriculum. 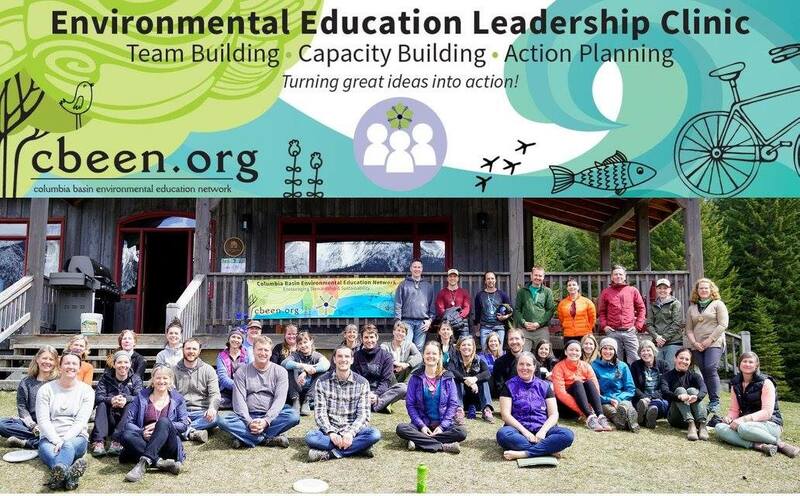 CBEEN and EEPSA will co-host a Leadership Clinic from Saturday, April 29 – Tuesday, May 2 at Nipika Mountain Resort– a beautiful eco-resort adjacent to Kootenay National Park. All K-12 teachers from the Columbia Basin region (School Districts 5, 6, 8, 10, 19, 20, & 51) are invited to apply. The application period will close on February 15, 2017. All food, accommodation and learning supplies will be covered. EESPA and CBEEN are looking to provide coverage for teacher release time (2 days). Participants will be responsible for getting to and from the Leadership Clinic. Carpooling is encouraged we will provide a contact list of participants so that costs can be shared and carbon emissions are reduced. A team of teachers from each school district will be selected to attend. Participants will be selected based on their background in environmental education and engagement in professional development in the school district. We will also consider school district size, geographic distribution of applicants, and representation of a variety of class levels and subjects. We will notify all applicants by February 24, 2017. What is involved in developing an EEPSA Local Chapter? 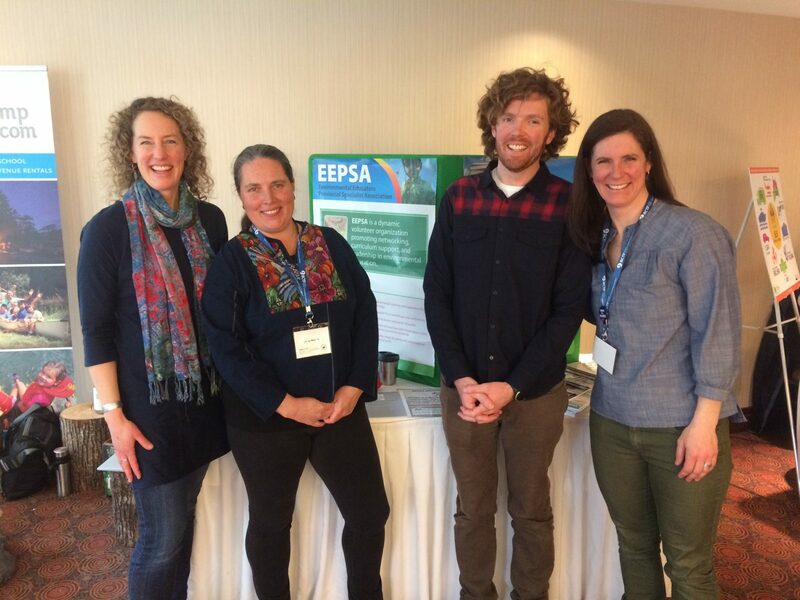 An EEPSA Local Chapter is a local, teacher-led organization that helps teachers come together to collaborate, engage in professional development and influence curriculum. Each chapter needs a president to set the agenda and chair the meetings, a secretary to compile minutes and send them to our secretary and a treasurer to submit your expenses for reimbursement. You can invite administrators and community educators to be involved, but it should be led by BCTF members. Local Chapters and PSAs exist under the auspices of the BCTF. ChildhoodNature is a term that researchers have developed that helps us to remember that children, and all people, are part of the natural world. Children and young people like you understand that the natural world, including plants and animals, is very important for many reasons and you have many ideas about how to share our planet with other living things. We hope that your submissions in The ChildhoodNature Companion can help all of us, including adults, learn from children and young people about how to build and sustain lasting relationships with animals, plants, and other living things in our homes, backyards, neighborhoods, parks, oceans, and in many other wild and not-so-wild places. Enhance your professional capacities to meaningfully integrate nature-based and place-conscious learning within your educational practice, through a community-oriented, experiential and inquiry-based approach in our Master of Education (M.Ed.) program. Explore philosophical underpinnings and develop ongoing relationships with specific places and communities as a foundation for your personal and professional practices. Become immersed in local ways of knowing and being in the world through holistic, reflexive, reflective, experiential, as well as relational practices as you study in various locations within the Maple Ridge-Pitt Meadows School District and other locations within the Lower Mainland. EEPSA represents at the New Teachers Conference on February 24-25, 2017 in Richmond! We enjoyed our conversations with new colleagues about place-based learning and the renewed curriculum. BCTF Conference for New Teachers, New TTOCs, and Student Teachers. EEPSA will be presenting a workshop and have an information table. Get involved in the ninth year of Science World’s BC Green Games, a province-wide competition designed to motivate action, enable sharing and celebrate the green efforts of BC schools. We are currently recruiting a team of judges to review submissions and select 5 elementary and 5 secondary team projects, awarding each winning school $1000 to continue their green initiatives! Over the past eight years our competition has attracted over 800 projects from over 40 school districts across British Columbia covering topics such as schoolyard greening, energy conservation, recycling & composting and community stewardship. Get inspired by last year’s entries – check out the project gallery at www.bcgreengames.ca. Your energy and expertise is needed to view and judge approximately 10 assigned projects, from your home or work, using our teacher-tested evaluation rubric. All confirmed judges will receive a detailed judging package including sample projects and will be invited to a training workshop (either in-person or online). Your volunteer commitment will be approximately five hours and must take place between March 2 and March 16, 2017 at your discretion. Get inspired and support our students’ green initiatives by volunteering as a judge! Send your confirmation to info@bcgreengames.ca by February 20, 2017, with your contact information and reason for interest. If you have connections to other passionate environmental educators or professional colleagues please forward this invitation. The Power of Positive, Inspiring Solutions webinar will showcase the power of positive, inspiring solutions to the worries that are causing so many young people to lose hope, including the climate crisis and wider ecological crisis. It will show how, using a positive three-step approach, you can turn worry into hope, and then into action. Webinar presenter Guy Dauncey is a futurist who works to develop a positive vision of a sustainable future, and to translate that vision into action. He is founder of the BC Sustainable Energy Association, and is an Honorary Member of the Planning Institute of BC, and a Fellow of the Royal Society for the Arts. This Place-based Education webinar will showcase examples and discussion about what constitutes excellent place-based curriculum and student work and how these authentic products inspire deep learning. Webinar presenter Amy Demarest is the author of the book Place-based Curriculum Design (Routledge, 2015). She is a former middle-school teacher who now works with formal and non-formal educators in a variety of settings. Most of the graduate courses she has taught have been on standards-based curriculum design but recently she has been able to focus solely on place-based design work. Our 8th annual Walking the Talk for Green Schools Solstice Celebration is coming up December 15th at Science World. This is a rich opportunity to mingle with the EE network in Metro Vancouver, be inspired by great work happening around the region, meet community educators eager to help you connect your students to place, and find out how you can advance EE in your classroom and beyond. I look forward to seeing you there! EEPSA members are welcome to join the executives’ bi monthly meetings. This is a chance to learn more about the diversity of activities that EEPSA is involved in. Topics include BCTF business, previous work of EEPSA, and upcoming EEPSA projects. Canada C3 (Canada: Coast to Coast to Coast) is a pan-Canadian Government of Canada signature project for Canada’s 150th Anniversary of Confederation celebrations taking place in 2017. Canada C3 will celebrate the people and places that have shaped Canada’s identity and those who are shaping its future. Engaging millions of Canadians across the country, the centrepiece of the project is an epic 150-day sailing expedition from Toronto to Victoria, via the Northwest Passage. The four central themes of the Canada C3 project are Diversity and Inclusion, Reconciliation, Youth Engagement, and The Environment. As part of the Canada C3 project, we are creating, together with teachers from across the country, the Canada C3 Digital Classroom. The members of your PSA have been identified as teachers and educators we hope to engage in this initiative. Specifically, we are inviting your members to contribute to the Canada C3 Digital Classroom which will launch in early 2017 and be promoted through an extensive network of national and regional education partners already well established in Canadian schools. This content will be further enhanced by educational resources that are being provided by dozens of national educational NGO partners who specialize in one of the central themes highlighted above. Teachers from across Canada who design and contribute an exemplary learning module for the Canada C3 Digital Classroom will be invited to apply to become a Canada C3 Participant on one of the 15 legs of the expedition. Please visit www.CanadaC3.ca for more information, or email Tim Straka at tim@canadac3.ca . Take Me Outside Day, in partnership with The Child and Nature Alliance of Canada, is an opportunity for schools across Canada and around the world to show the importance of getting outside. It’s a day to support education extending beyond four walls and a desk! Please join me for a focus group discussion on curriculum development for the Squamish Place Names Map on Wednesday October 19th at 6:30pm at 1532 Salsbury Drive in the Commercial Drive area of Vancouver. At this meeting, we will be seeking input on learning materials to accompany the Squamish Place Names Map for all age groups and subject areas. This meeting will be a chance for you to learn about, and share your thoughts on, incorporating Indigenous knowledge in the curriculum and place-based education. And it will be an opportunity to connect with other teachers who are exploring these same questions. In the spirit of knowledge exchange, participants in the focus group will be welcomed with an overview of important Squamish language, territory, and protocol information, which can be immediately and easily incorporated into your classrooms and lives. Light refreshments and snacks will also be served. Please confirm your attendance and let me know if you have any questions. Our Master of Education (M.Ed.) program in Curriculum & Instruction: Ecological Education is now accepting applications for Summer 2017. This symposium will explore the challenges of bringing place-based curriculum, place-conscious learning and geographic literacy into the classroom, and bringing the classroom out into the physical and cultural landscape. Our intended audience includes Social Studies educators, teachers who love field trips, and others who want to bring an aspect of Place into their Fine Arts, Humanities, Environmental Science, English/Language Arts, Applied Skills, or Intermediate teaching practice.